Maotai liquor is the drink of choice for Chinese politicians, celebrities and wealthy businessmen alike. It supposedly ranks as one of the three most well-known spirits in the world, together with whisky and cognac. Yet outside of China, few people know much about it and even fewer have sampled it. So what exactly is Maotai liquor? And how does it rank among more familiar spirits from other countries? Maotai, also known by the brand’s original Romanization of Moutai, is a type of baijiu that is distilled from sorghum. Baijiu, which literally means “white alcohol” or “white liquor” in Chinese, is a clear, strong liquor that is usually distilled from sorghum. In the South of China it is sometimes made from glutinous rice and in the North it can be made from wheat, barley or millet. Different brands of baijiu vary from 40% to 60% alcohol by volume, although Maotai ranges from the standard 53% through to 35% proof. Baijiu is similar to vodka in terms of its texture, strength and appearance, but is said to have a sweeter taste. Maotai is often described as a “sauce-scented” or “sauce-fragranced” liquor because it carries the faint aroma of soy sauce, which makes it unique amongst other brands of baijiu. Maotai is produced exclusively in the town of Maotai, near the city of Renhuai in southwest Guizhou. It is believed that the climate and locally grown sorghum in the town is what gives the liquor its distinctive flavour. 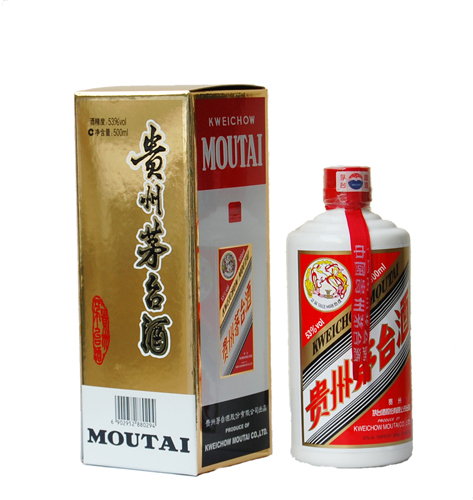 Attempts have been made to produce Maotai elsewhere but nowhere else has managed to replicate its unique taste. Apparently the process of making the liquor creates such a pungent odour that the entire town of Maotai is said to smell like fermenting sorghum. The town began manufacturing the liquor on a large scale during the Qing Dynasty (1644-1911). It was the first liquor in China to be mass-produced and during the Qing Dynasty it had an annual output of about 170 tonnes. In 1951, two years after the People’s Republic of China was founded, it was named China’s national liquor. By the 21st century, it had become so popular that more than 6,800 tonnes of Maotai was sold in 2007 alone. Its first international acknowledgement came during the 1915 Panama-Pacific Exposition in San Francisco, where it won a gold medal. At the 1985 and 1986 Paris International Exposition, it won two consecutive gold medals. Since the Cultural Revolution, it has won 14 international awards and 20 domestic awards. Due to its popularity and international recognition, it is frequently used on official occasions in China, particularly when foreign politicians or distinguished foreign guests visit China. It is the only alcoholic beverage that is deemed worthy to be presented as an official gift to foreign countries by Chinese embassies. It received the greatest exposure during the state banquet that was held for U.S. president Richard Nixon in 1972. At this banquet, the Chinese politician Zhou Enlai offered the liquor to Nixon and, ignoring the advice of his associates, Nixon engaged in toast with Zhou and drank the liquor. Although it is not so widely available outside of China, currently about 200 tonnes of Maotai is sold annually to over 100 countries across the world and its international popularity is slowly growing. With all of these accolades and international publicity, it’s surprising that the Maotai brand is still relatively unknown outside of China. This is in part due to the fact that Maotai, and baijiu in general, is considered almost universally unpalatable to foreigners. It’s a real love or hate type of drink, with some people relishing it as a deliciously sweet and spicy alternative to vodka and others, like American journalist Dan Rather, describing it as being like “liquid razor blades”. The only way to truly know whether it’s for you or not is to take a trip to Maotai and give it a try!